Last friday there was a march and rally outside the Mets – Diamond Backs game at CitiField in Queens, NYC. The NYPD forced the rally to confine itself to a small pen across the street from the stadium, behind a fence and under a subway platform. As a result, the rally itself was almost totally unnoticeable for fans getting off of the train and going directly into the stadium (let alone if you parked in the lot right next to the stadium); could see or even hear the few hundred people gathered at that spot. However, dozens of us abandoned the rally point and walked around the plaza outside the stadium passing out flyers about SB1070 along with big signs to hold up during the game (NO SB1070! BOYCOTT ARIZONA!, etc.). This was pretty effective, and i’d bet that almost everyone entering the stadium from the subway at least saw that something was being protested, and that it had something to do with immigration and Arizona. In addition to those efforts, there were about a half-dozen others who had bought tickets to the game and went in with carefully planned direct action. All student activists, mostly from CUNY, four people dropped two big banners off of the stadium, and another two jumped into the field and sprinted across with Mexican flags and t-shirts about SB1070. I didn’t even know this was happening until i saw folks later who showed me the press coverage of the protests (see below, including some GREAT full-page photos published in the Daily News on Saturday). I think the way that the rally (with 1199, DC37 and other large endorsers), the targeted leafleting and direct action was very effectively coordinated in this action, and it seems to have worked! It seems to have created a media spectacle– something that is dramatic enough to catch people’s attention (complete with great photo ops), had a relatively informed audience for the drama (thanks to flyering the fans ahead of time), and all with solid ‘main-stream’ backing to lend credibility (i.e. the unions). This can’t substitute for the long, slow work of building our bases wherever we are rooted, but it certainly contributes to a vibrant movement! Lets hope this sort of creative organizing continues! As protests over Arizona’s immigration law heat up in the city, a federal appeals court says it will step into the battle later this year. The Ninth Circuit Court of Appeals says this November it will hear a challenge by Arizona Governor Jan Brewer, who appealed a judge’s ruling blocking the law’s toughest sections. That would give the state time to make changes to the legislation, which Brewer says she is considering. Meanwhile, protestors gathered outside Citi Field in Flushing, Queens on Friday, where the Arizona Diamondbacks opened a weekend series with the New York Mets. 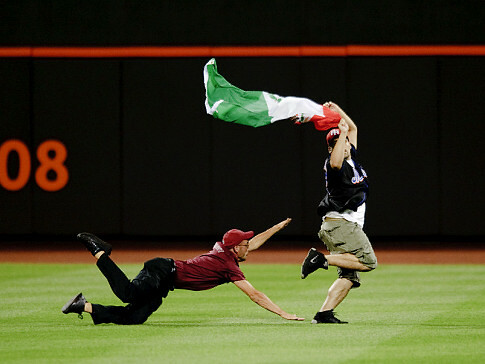 During the seventh inning, two men were arrested for running out onto the field carrying Mexican flags. Diamondback outfielder Cole Gillespie told NY1 that the baseball team has nothing to do with Arizona’s law. Protesters said the demonstration at Citi Field was part of a growing national movement. “The Diamondbacks are symbolic, but more importantly we’re telling Major League Baseball that they should follow its tradition of diversity, its tradition of respect,” said a protester. “We’re happy that more and more people understand this and are protesting it not only here, but all over the country,” said another protester. Some demonstrators also handed out leaflets asking Major League Baseball to move next year’s All-Star game out of Phoenix. Yesterday, protests were held all over the country, including here in the city. Hundreds of demonstrators walked across the Brooklyn Bridge to a rally at Foley Square. Forgot to mention … Here’s the website for the coalition that put a lot of the work into the larger protest and organized the direct action: Arizona Boycott Coalition! Check them out – they have some good videos of the actions there!